The 220W-3 Series ball-grip screwdriver features a replaceable handle and three interchangeable double-ended bits (6 tip sizes in 1 tool). The handle’s spring-leaf bit retainer design securely holds the reversible bits in place. The 220W-3 “ball-grip” handle may not look like a conventional style screwdriver but there are many advantages to the palm-grip design. It’s very versatile, ergonomically designed, and fits comfortably in the palm of your hand. When gripping the ball-shape handle, an operator can apply their body weight behind each turn for excellent leverage while fastening which results in higher torque output. Also, the built-in cushion finger knurl allows for quick turning and fine tuning of small fasteners. The 220W-3 Series are suitable for electrical work, automotive repair and maintenance, imported furniture assembly, snowboard bindings (pozidrive), and general fastening applications. 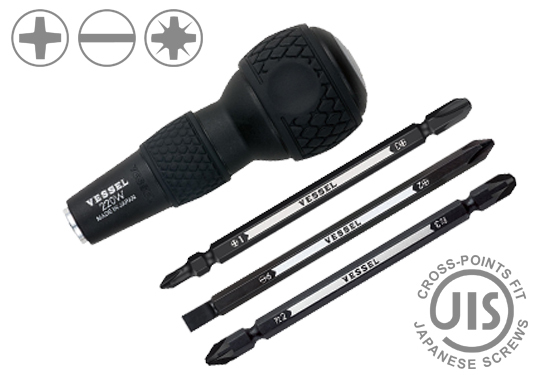 Also, the cross-point models are recommended when working with JIS (Japanese Industrial Standard) screws.